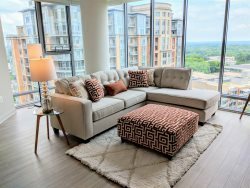 This 1100 square foot, 2 bedroom/2 bathroom apartment features a fully customized furniture package, upgraded fixtures, and hardwood flooring throughout. Enjoy a cup of coffee or glass of wine on your own private balcony off the master bedroom. All Dwel apartments are 100% smoke free. Smoking is not allowed in the apartment, on balconies, in common areas and the garage. Violation will result in a $500 charge and could lead to eviction. The front desk can advise on designated off-property smoking areas.